Again on the note of not succumbing to propaganda used to create in us false memories, to re-write history, as we honor and remember President George Herbert Walker Bush, all this talk about the a time when people got along in Washington is beyond wrong. The press coverage of the 41st President was vicious; Democrats in Congress treated him with disdain; Liberals across our society and in entertainment constantly mocked George H.W. Bush, and; all ganged up to deny him re-election to the White House instead backing the moral reprobate Bill Clinton. Most who understood the Reagan Revolution have great respect for George H.W. Bush and have disappointments with him that rise to legitimate anger. 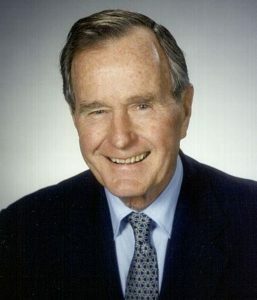 But one thing most reasonable people understand is that Bush was a man who loved his God, his family, and his country and was wholly descent in a way that set a true national leader’s example for our nation and society. As our former President and Texan is laid to rest in the Lone Star State, we are reminded that the Bush family is a true family in the Biblical-sense as opposed to the staged falsities so common in our often vapid celebrity culture.